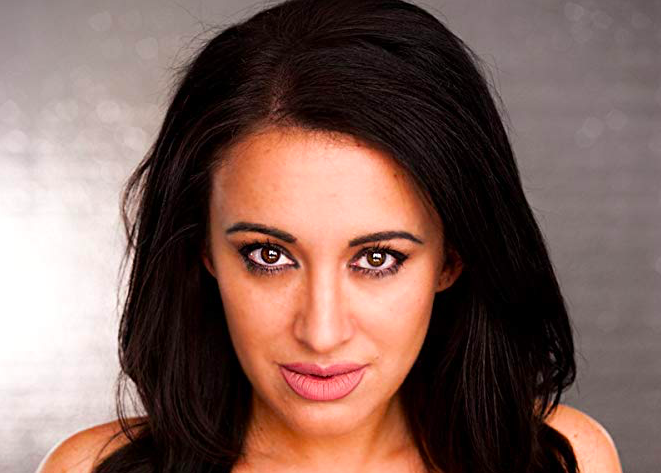 In an Exclusive interview, actress Devanny Pinn talks producing & starring in Crossbreed (as the Crossbreed) and the journey to getting there. Devanny Pinn has made her mark on the television screen. Now, she’s taking the industry by storm as a producer as well. Crossbreed is her latest project, a fun movie loaded with awesome scenery and a cast full of characters you immediately fall in love with. It doesn’t get much better than this. You’ll notice immediately that the world they created for this film is a world you can’t help but be curious to know more about. There are elements of mystery, political drama, sci-fi, action, and horror all combined. Bottom line — it is well worth the watch. Here’s what Devanny Pinn had to say about producing and starring in Crossbreed. Commyounicate interviewer – Ryan Mekkes: You have a musical background; you’re a classically-trained vocalist, you sing pop as well, and you’re a ballet dancer. So you’re a triple threat; you do it all. How has that background helped you in your acting career? Pinn: Quite a bit, actually. I didn’t know I liked the acting part of it until I was grown. I grew up doing musicals, ballet, theater — I loved performing. But I was always focussed on either the ballet or the musical/vocal elements of it. So I really didn’t dive much into acting until I was 17. I got a musical theater scholarship for focus on opera — because I was gonna go to college — and I moved out to Arizona to pursue that. And I tried to find a local theater community to get involved with, and I couldn’t find any. But I ended up finding an independent film audition. I didn’t know anything about film; I just went for fun to the audition for a movie, and I ended up getting the lead in it. And it was a horror movie. And I just fell absolutely in love with acting. And that abruptly became my focus and my career. Mekkes: I’m just curious — when you’re acting in a horror movie, do you ever get freaked out, yourself? Does it ever make you nervous filming scenes like that? Pinn: Yes! actually. There’s a variety of reasons and ways to be freaked out when you’re making a horror movie. Like, sometimes if you’re so deep in a sequence — and this depends on what some filmmakers do as opposed to others — but I’ve had some directors and such where if I’d find a victim in a scene, for instance, they will keep the perpetrator, the villain, the creature, whatever it is I’m dealing with — they will keep that away from the set. And they will keep it really quiet and really dark so that way, when you play out the scene, especially for the first time, you get a really genuine reaction. So I’ve had some times where it’s not just playing the scene — it’s actually really living the moment. And so that’s been kind of scary and that’s the really cool stuff. Pinn: Yeah. (laughs) On the flip side, I have a phobia of cold water. It’s really, really random, I know — and creepy. But I really wanted to embrace that fear. So I’ve done now several movies where I had to be in the water. One of my first was Piranha 3d. We shot in Lake Havasu, in a real lake with all kinds of weird stuff in the water, and sea life, and we were kind of just left out there for half a day at a time. And so I had to not only die by piranha, but face the fear of constantly being in this cold water that I couldn’t see through with who knows what living in this lake. Sometimes you have to actually embrace things that you’re afraid of in acting. And then in one of my earlier films, I had to jump off of a roof. I’ve also had to climb out of moving cars on the freeway — I’ve had to do some stuff that’s like legitimately frightening while filming. What’s cool about it, though, is you kind of get a rush. And when you see playbacks where you watch what you’ve created, its a really awesome feeling. So it ends up being worth it. Even in the worst moments of it, it’s all still a dream job and lots of fun. Mekkes: Wow. I usually tell my friends, you know what, the most underrated individuals in society are actors. Don’t mess with actors because they have all these random skills; you just don’t know what they know. Pinn: (laughs) You don’t know what they know, what they’ve been through, or what they can endure is absolutely true. Mekkes: You have a lot of credits in movies and television. You’ve mentioned some of your scariest moments filming — but what have been some of your most memorable acting experiences so far? Pinn: I’m pretty lucky in that I got to work pretty consistently from the beginning of my career with some crazy talented people. A lot of people. Really amazing horror icons like Linda Blair (from The Exorcist), Michael Berryman (from The Hills Have Eyes), Tony Todd (from Candyman), Kane Hodder (Jason in Friday The 13th), Tara Reid (from American Pie) — these genre icons from franchises and our favorite horror movies. I really got an opportunity to work with some of the best in the business at what they do and watch how they work. So every time I get to work with someone whose work inspired me, its really, really rewarding. And then to see some of the best special effects artists who build master crafts as far as makeup or creature effects — it’s just really so cool to see how these things come to life, how things are made, and how the best of the business are doing it. It’s really, really, super fun. Mekkes: Let’s talk about your new movie, Crossbreed. I really liked it. Mekkes: I really love in movies when there’s a big universe — a well put-together, well thought out universe in which the events take place. I always ask, Is it a big, massive area that we’re talking about? And you did such a great job putting together an awesome universe that made sense. And the scenery was super incredible. Pinn: Thank you so much. Mekkes: It looked really, really cool. When the camera would zone out and show the big perspective, the bird’s eye view on the cities and landscapes, I was really impressed. It was really cool looking and really pretty. Pinn: Thank you so much! It really makes me so happy to hear those kinds of comments, specifically, because our favorite thing about being able to do Crossbreed was world-building. That was what me and the director/writer, Brandon Slagle, were most excited about for this film, was to build this futuristic world. And so for you to not only notice it, but to get it and embrace it — that is so rewarding to hear because we had a blast developing new technologies. And integrating our current society into a near-futuristic one was so much fun. Mekkes: It was sick. Are you working on a sequel? Pinn: We are hoping to expand this one; we’re hoping to develop the world as a television format. Mekkes: Oh that’s awesome. Something else that really impressed me was that it’s really hard to create an intelligent, non-cheesy alien life form that’s — not corny. I don’t know how else to put it. Pinn: When you have budget or resource restrictions, to be able to pull it off seriously, have the world take it serious, and then have the viewers take it serious, was a very difficult task. But the director is a huge fan of these kinds of movies and this kind of content; Alien and The Predator are some of his favorite types of films. So he really focused on trying to reach specific viewers in this way, and it sounds like he’s been effective at doing that. So I’m gonna pass those comments along because I know he’s gonna be really relieved to hear that. Mekkes: Yeah, it was just really cool because you could tell — and I want to get into your acting in just a second — but you could tell that the crossbreed was intelligent life. Pinn: Well I’m so glad to hear that you got what we were trying to do with it and that it was effective for you; that’s everything. Thank you. Mekkes: So now to the person who actually gets credit for much of this — you: what was your thought process behind creating the alien crossbreed as a character? Pinn: We knew that we wanted to take some of the favorite parts of what fans enjoyed over the years on some of their favorite action movies — especially from the 80’s and the early 90’s — and put that into a movie that seems familiar and likable, but also brought something different to the table. We also really loved badassery and big elements. And we really wanted the creature to be an imposing physical threat. Devanny Pinn as the crossbreed in Crossbreed. Courtesy, October Coast. Mekkes: What was it like getting into all that makeup and everything? Pinn: Oh my gosh, the makeup process was so long. So, I had to get into makeup several different days to shoot. And, our longest day was just under sixteen hours. Pinn: Yeah, it was a really long day. And I’ve done prosthetics and gags and stuff before from all my horror movies, so it was not a big deal, I thought. But this was full-body latex and prosthetics pieces all up and down. And so it was an undertaking. And our makeup effects team was awesome and patient and really innovative with how they were able to get this done. But it was so fragile. Like, I couldn’t move much at all during the entire process because the latex would tear; the prosthetics pieces wouldn’t dry right. I was also producing the film, and so I had to kind of run the set as half an alien over the course of the day without saying much or moving much. (laughs) And then the headpieces — when they were applied, it made it difficult to see or hear. So when I was dressed out, I was really dependent on the director and different people helping me get around to move at all without destroying the makeup. It took so long to do it, and it was a mess. But it looked so cool on camera and was really so effective that when I saw the first pictures when it was done, I was like, alright I can do this. Mekkes: It was definitely a cool looking creature. Your cast was really talented as well. It seemed like there was great chemistry there. Pinn: They’re awesome. Oh my gosh, I had the best cast. They’re as cool off camera as they are on. They really [clicked] immediately. The guys worked perfectly together, had great chemistry. They were just constantly cracking jokes; they’re so much fun to work with. Mekkes: Do you have any stories from on-set you’d like to share? Pinn: I have a lot of weird alien stories. For instance, when Daniel Baldwin was coming in to do his work, he got in late at night, and I had to have the hotel prepped for him. But the hotel wanted to speak to me during check in, but I couldn’t go because I was half an alien at that point. So I’m on the phone video chatting with the hotel trying to get Daniel checked into his room, and we shot in upstate New York and so they were all kind of geeking out because they weren’t used to seeing celebrities. And so I’m trying to tell them, don’t nerd out over Daniel; just put him in his hotel room. And they’re like, well, can you come down here? And I’m like, I’m an alien. I can’t go down to the hotel right now. (laughs) So there were a lot of really funny challenges. And Stink Fisher, who’s our star — he’s awesome — he and Daniel worked really, really well together. They’re both hilarious. Great, funny stories. I’d have to yell at everybody, No, this is a serious scene! Stop! So it was just fun. A lot of times, on set, it is really just work and very stressful. But for this one, everybody really didn’t want to be done with it. Everyone really kind of felt like they were making something special and embraced that. And we’re all really excited for it to finally be coming to you guys. Daniel Baldwin in Crossbreed. Courtesy, October Coast. Mekkes: That’s really cool. So you did mention the TV thing; is there anything that you can reveal at this point about that? Is it in the works? Or is it a concept at this point? Pinn: We have literally just put it together. We weren’t sure because you never know, when you’re in post, what it can turn into, but it really came together nicely. And like I said, we were very proud of the world. And the ability to kind of expand that [is exciting]. I want to give a shoutout specifically to Daniel Baldwin and Vivica Fox, who have been so supportive of us and have been behind this project from day one. It was actually Daniel’s idea to potentially develop this for a series format. He really believed strongly in that. And so we’re fighting hard to make it happen because we really want this team to continue to have the opportunity to showcase the incredible characters that they brought to life. Mekkes: That is exciting because I totally want this to continue. Mekkes: Yeah, I’m curious as to where this could go. It’s kind of like when you watch a pilot on Netflix and then you’re like, okay, I want to see more. Pinn: That’s what we’re hoping will happen. Because we just think we have something special with this futuristic government background we’ve created. We’ve received a lot of praise for Vivica Fox being the first African American female president in a movie. She’s gotten a lot of support for that, so we’d love to explore that more. We’d love to explore the other alien races out there. The pending inter-galactic war; there’s just so many different avenues to this world that we’ve built that viewers could definitely catch some more of. So hopefully we’ll get the opportunity to do that. Vivica Fox in Crossbreed. Courtesy, October Coast. Mekkes: And I’m sure there’s also parts of the world that you weren’t even able to show, am I right? Pinn: Absolutely. Yeah, we had a lot of very tiny little nods here and there that have whole origin stories and backgrounds to the technology, to day to day life, to futuristic civilization on earth, as well as the moon and the surrounding galaxies that we ended up building. So there’s a lot to explore. 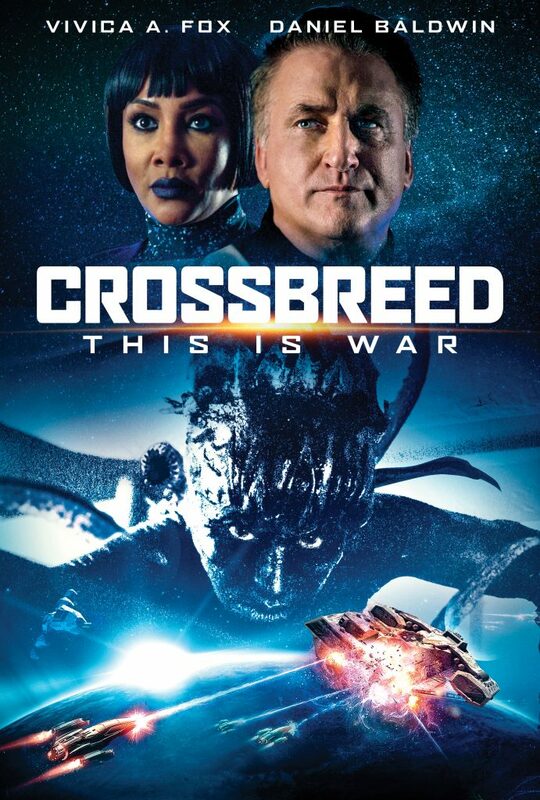 Devanny Pinn stars in Crossbreed, set for release on February 5th. To read my interview with her co-star, Mu-Shaka Benson, you can click right here.